In my previous post about Venus in Libra, I promised some sugar. Well, here it is. From August 24th to August 27th, Venus in Libra will square Jupiter in Cancer (at 13 degrees). Jupiter is the planet of expansion and optimism. When it squares Venus, there will be tension, but it will tension of the yummy sort. 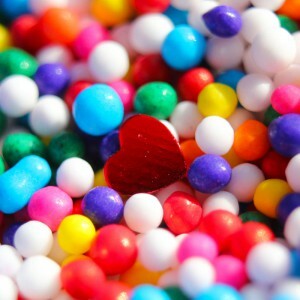 Big love, big desire, the urge to give everything to one, sweet moment/person. It's a sugar-shock kind of energy, unexpected and overboard. Venus in Libra is concerned with the other person, and Jupiter in Cancer is Big Nurturing. So this energy will about making someone else happy, or getting a stupendous gift from someone else. Will it be deep, dark and gritty? Nope. If anything, it will gloss over the rough stuff and concentrate on what feels good. But that's ok, especially if you need a break from depression, angst, heartbreak or anger. Whether you're involved, working on being involved, or single, this influence is about feeling really good because of what you put out there, or because of how people perceive you (Libra). And if you're not expecting anything...even better. This influence can being sudden, sweet joy. You can overdo it. Squares to Jupiter are known for their over enthusiasm. But this influence is so brief, and the contact to Venus so....benign....that it will be quite difficult to screw up. Even if you push your affections on someone a bit too hard, there will be no damage done. If you have planets/angles from 9-13 degrees Libra or Cancer, get ready for a real nice gift.